A crab which found itself at the centre of a minor political controversy has side-stepped further media attention. The crustacean was christened Peter by the Deputy Prime Minister, John Prescott, on Monday in an apparent swipe at Peter Mandelson, the Minister without Portfolio. 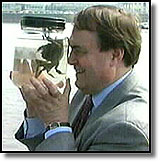 The government's Environment Agency used the crab in a photo call with Mr Prescott to promote a new flood defence scheme along the Thames. It says the crab is actually called Dennis, and is - confusingly - a female. A spokesman said Dennis had had her 15 minutes of fame and did not want to be drawn into any sort of political debate. The spokesman declined to reveal the current whereabouts of the Chinese mitten crab (Eriocheir sinensis). Mr Prescott held up the crab in a jar of water and told journalists: "You know what his name is? He's called Peter. Do you think you will get on the executive, Peter?" The quip prompted a flurry of "clarifications" from Downing Street. Mr Mandelson was reported to be "relaxed and amused" by the comment. At the time, no one asked Dennis how she felt.